Harboring Unionist sentiments, Richard N. Goode appears an unlikely candidate to serve as mayor of Waco, Texas, during the Civil War. A lawyer and a judge, Goode served as the fourth mayor of Waco from June 1862 to May 1865. Clearly, Goode’s pro-Union sentiments did not prevent him from serving the people of Waco, and his family’s papers document this aspect as well as other interesting tidbits on his life. 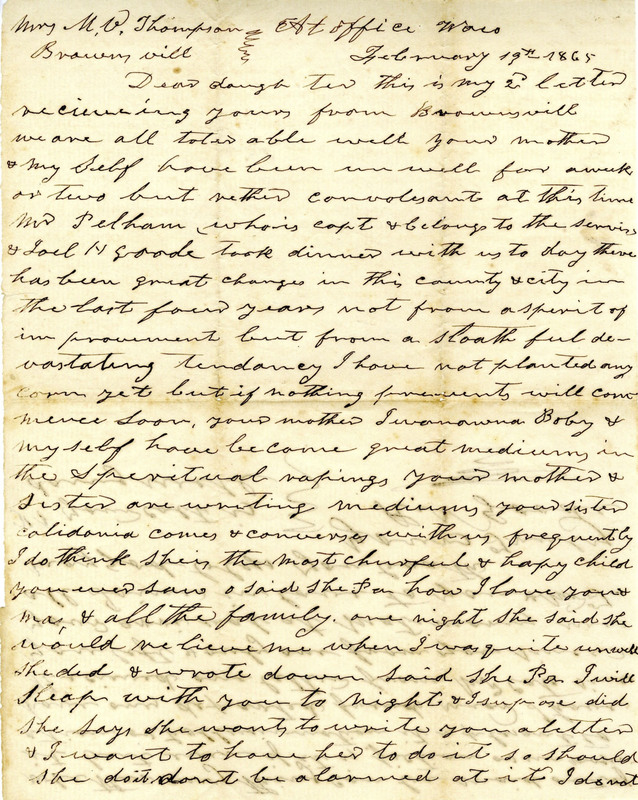 Letter from Mayor Richard N. Goode to his daughter, Mary Virginia, Thompson, describing the family’s embrace of spiritualism, or talking to the dead. Mayor Goode’s deceased daughter Calidonia “comes and converses with us frequently.” Goode-Thompson family papers, box 1, folder 3. Goode moved to Waco in 1859. He and his wife Elizabeth Mallory Goode were married in Hinds County, Mississippi, in November 1837. The couple had at least eight children: Mary Virginia, Richard, James, Robert, Ivonanna, Olivia, Ursula, and Blanche. A ninth child, Calidonia, likely died in childhood. The only reference to Calidonia in the historical record comes from Judge Goode’s letters to his daughter, Mary Virginia. During the Civil War, the Goode family participated in spiritualism, or talking to the dead, using various means of communication including séances and rappings. In his letters, Goode describes communications from Calidonia, Mary Virginia’s sister, even telling Mary Virginia at one point that Calidonia wished to send her a letter! Goode also consulted the spirits regarding the outcome of the war. The Goodes were not unusual in seeking guidance from the spirit world. 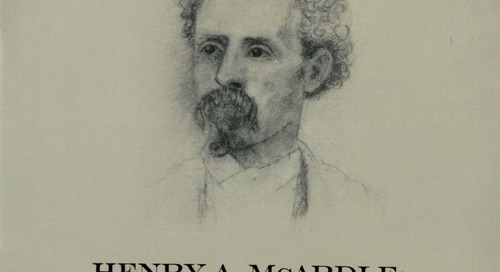 Thousands, if not millions, of Americans participated in spiritualism in the late nineteenth century. 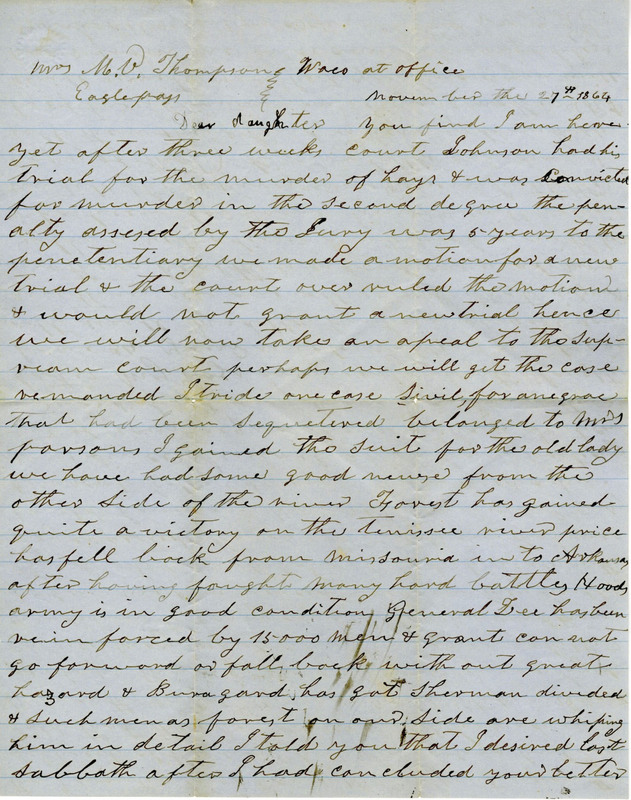 Letter from Mayor Richard N. Goode to his daughter, Mary Virginia Thompson, reporting on the outcome of a recent murder trial and the progress of the Confederate war effort. Goode-Thompson family papers, box 1, folder 3. Judge Goode’s letters also include references to his court cases, including a murder trial, the progress of the Confederate war effort, and the presence of wartime refugees in Waco. 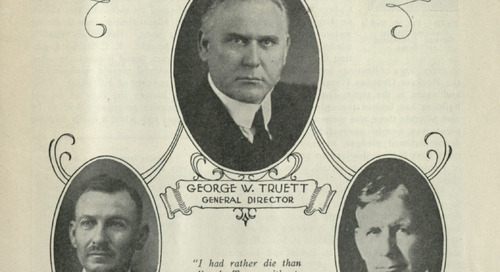 Judge Goode also described the hardships of war, asking his daughter to send goods from her home in Mexico. In addition to his legal and mayoral careers, Judge Goode owned land just above the mouth of Barron’s Branch on the west bank of the Brazos River. In March 1872, John T. Flint, president of the Waco Bridge Company, tried unsuccessfully to convince Goode to close the ford, which was used to avoid paying the toll on the Waco Suspension Bridge. Finally, in 1877, four years after Judge Goode’s death, the Waco Bridge Company succeeded in purchasing the land from Elizabeth Goode for $350. Soon after, the company began a piling project to close off the ford. 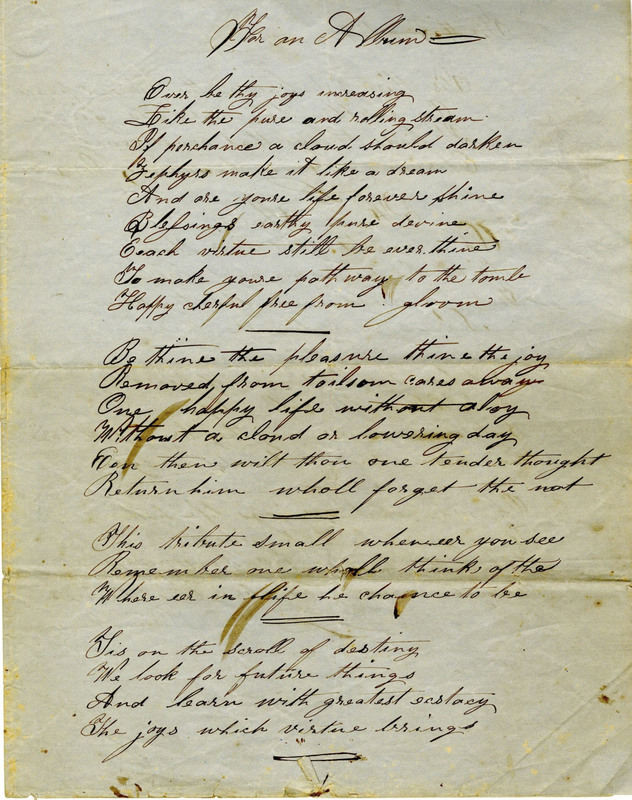 Poetry written by William Carson Stewart Thompson sometime after the death of his father, Dr. — John Thompson. Goode-Thompson family papers, box 1, folder 5. The Goode and Thompson families merged in July 1859, when Mary Virginia Goode, Judge Goode’s eldest daughter, married William Carson Stewart Thompson, son of Dr. John and Isabella Thompson. In 1864 and 1865, William and Mary Virginia resided in Mexico. There is no evidence that William Thompson served in either the Confederate or Union military during the Civil War. William and Mary Virginia had two sons: Edward Everett Thompson, born in Matamoras, Mexico, in 1865 and Rufus N. Thompson born in Waco, Texas, in 1868. Mary Virginia Thompson died of consumption in 1876. 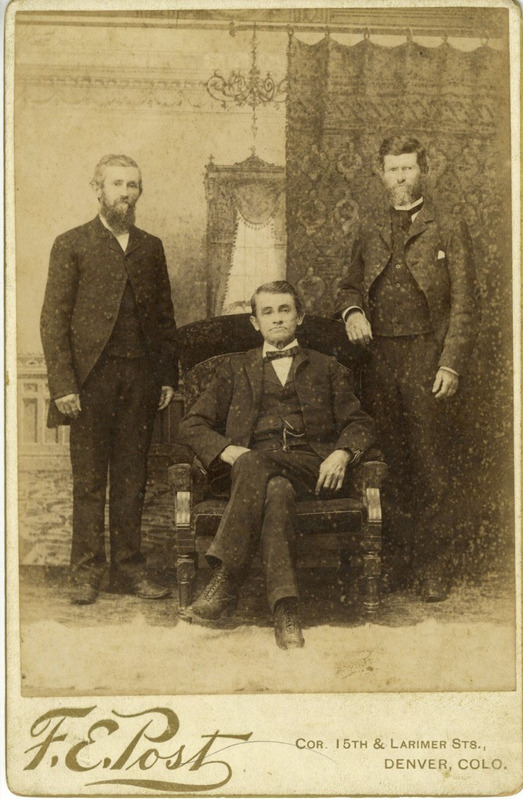 Three of the Thompson brothers (from left to right): Rufus Andrew Thompson, William Carson Stewart Thompson, and Nathaniel John Thompson. Taken in 1889, the caption on the back of the photograph reads: “Three Brothers after a Separation of 35 years.” Goode-Thompson family papers, box 1, folder 7. In 1889, William Thompson and his younger brothers, Rufus and Nathaniel, were reunited after a 35-year separation. The Thompson brothers were born in Ohio in the 1820s and 1830s. William had moved with his parents to Texas in the 1850s while Rufus and Nathaniel remained in Ohio. At the time of their reunion, William resided in Waco, Rufus in Illinois, and Nathaniel in Colorado. William Carson Stewart Thompson died in Waco in 1895.Richard N. and Elizabeth Goode as well as Mary Virginia and William Thompson and their sons Edward Everett and Rufus N. and their spouses are all buried in Oakwood Cemetery in Waco. Although a small collection, the Goode-Thompson family papers provide an important glimpse into life on the Texas homefront during the Civil War.